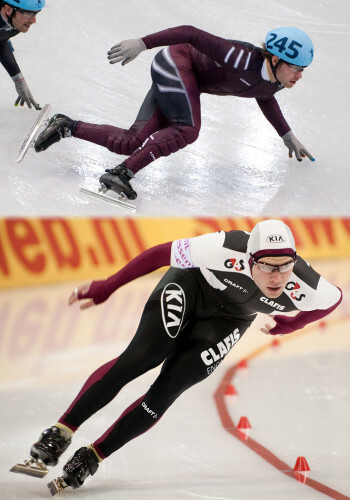 At the Vancouver Olympics in 2010, Latvian Haralds Silovs became the first skater in history to compete in both long track and short track speed skating in the same Olympics. That it had taken this long for an athlete to do this, is a fair indication that despite both sports being essentially about ice skating very fast and in circles, there are sufficient differences to render the sets of participants in each sport to be mutually-exclusive, save for a very small handful of exceptional individuals. This is the sport of short track speed skating, as opposed to long track speed skating. The main difference, as the name suggests, is the size of the track. In short track, races are conducted pack-style around a track measuring 111.12m, whereas in long track, skaters race in their own lanes and are run in pairs around a 400m track. This seemingly small difference in racing setup has led to a sizeable divergence in the two sports, so much so that, as I mentioned above, it took until 2010 for a skater to manage to do both at one Olympics. Harry isn’t skating short track at Sochi, although he is competing in long track, while Dutch skater Jorien Ter Mors will be competing in both (and is a medal chance in both). No skater at the Olympics would dream of showing up without being well-equipped. The shorter length of track in short track means that the corners make up most of the skating line while the skaters would be lucky to get one full stride in the straights. In long track, there are 200m of corner and 200m of straight on every lap, which has obvious implications for differences in equipment. The radius of a long track corner is between 24m and 30m (depending on which lane you’re skating in, and the setup of the track). A short track corner is marked at 8.5m and the straights must be at least 4m wide, which means that a short tracker’s cornering radius will be anywhere between 8m and 13m allowing for variations in line taken and setup of the track. First of all, since the cornering forces are greater, short track skating boots are much higher and stiffer than long track ones. My short track boots actually hurt to put on and take off, and are so hard that there is no ‘give’ when I try to push the ankles inwards. My long track boots, on the other hand, bend quite readily when pushed, and the ankles are much lower, which allows for the skater to feel the feedback of the blade through the ice much more, but sacrifices stability somewhat. The tradeoff is worth it because a larger corner does not require a skater to lean on his boot as much. All ice skate blades are curved – when you put weight on them at an angle, this curve causes the ‘contact patch’ of the blade on the ice to be a curved line, and that is basically how skates work. A long track blade is usually between 16 inches and 22 inches in length (depending on the height and weight of the skater) and will be curved with a radius of between 21m and 30m. 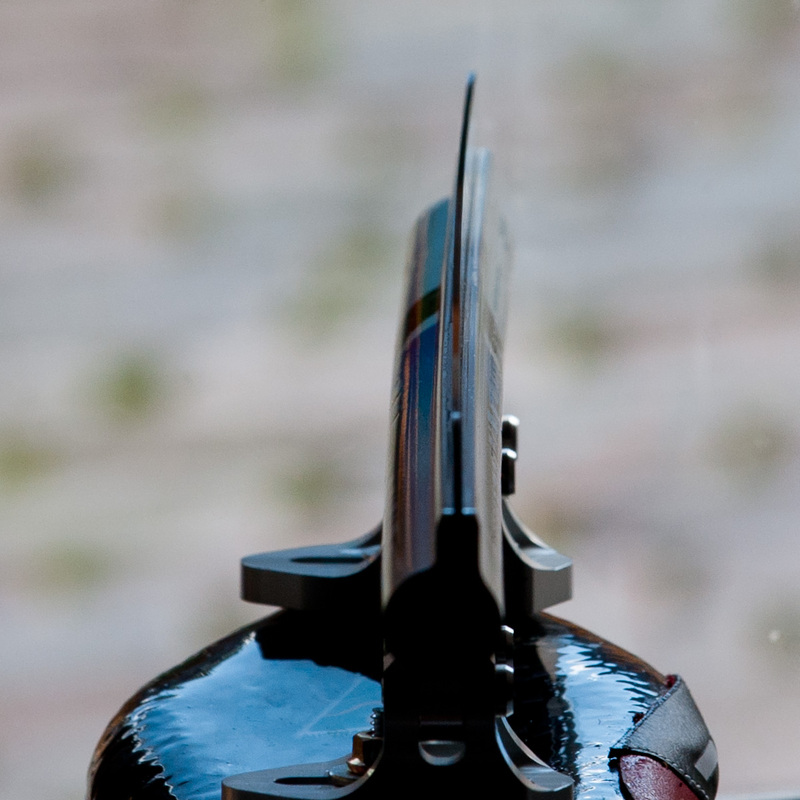 As a general rule, long distance skaters’ blades will have slightly more curve, allowing for easier steering of the skates down the straight (long distance skaters spend more time gliding, so this control is important), while sprinters will have very flat blades because that allows more blade to be in contact with the ice at any one time, which translates to greater pressure in the push, but at the expense of control. Ordinarily, the curve on a long track blade is constant over the entire length of the blade, though recently skaters have been starting to make small adjustments to this ‘standard’ setup, often by making it flatter towards the front of the blade to maximise pressure at the point when your bodyweight is rocked forward relative to your skating leg, for the push. The curve on a short track blade is dark art and often a closely-guarded secret. In short track, the blade setup is crucial since pack style racing demands a great deal of manoeuvrability in addition to being able to skate in circles at blindingly-fast speeds. To make things more complicated, the tighter corners demand a skater to lean at a greater angle which puts a whole new set of demands on a short track blade that makers of long track blades never have to think about. A ‘regular’ setup usually involves a fairly flat radius of between 10 and 13 meters in the middle of the blade, to facilitate glide and high speed stability, while the front and back of the blades are much more curved, usually to the tune of 5-6m radius. This allows a skilled skater (and everyone at the Olympics is) to rock slightly forwards or backwards on their blades to access some extra turning ability, usually to throw a pass, or skate around someone to avoid a crash. When you’re watching the Olympics, pay close attention when they do those slow-motion closeups of the blades which are all the rage with TV cameramen these days. On short track blades, it’s very common to see little black lines marking regular intervals along the sides of the blades – these are used by skate technicians (often the skaters themselves) to adjust their setup. As if that wasn’t complicated enough, short track skaters also adjust the ‘bend’ of their blades. The principle of it is simple enough, a pre-bent blade means that the moment the blade touches the ice, it is already turning a corner. Short track skaters, because they pretty much spend all their time turning corners, have both blades bent towards the left (we always turn left) to such a degree that you can see the bend quite easily with the naked eye. A standard setup is to have a constant bend throughout the length of the blade, but I have it on very good authority that most elite-level skaters have setups which differ from this. How? I do not know – those are closely-guarded secrets. Long track blades are often bent as well, but to a much lesser degree, so small that the bend is usually undetectable to the naked eye. It is also normal for the right skate to be bent, but not the left, or for the left to be bent only very slightly – this is because the left skate needs to be able to get good pressure on edges on both sides (it needs to steer to the right side during a left foot push on the straights), whereas in short track it almost never needs to be used to steer to the right. The parameters of bend and curve (called “rocker” in skatespeak) are so important, that some countries have special laser-scanners which can “read” the exact specifications of a blade, either so that a competitor’s setup can be reverse-engineered, or simply so that a good setup can be replicated. On top of all these differences is a big elephant in the room which I have neglected to mention until now – the clap skate. The reason for this is historic – clap skates were not introduced until the mid 1990s, and only made their Olympic debut in 1998. The blade is hinged at the toe mounting point and this facilitates a biomechanically smoother movement at the end of the push. I am of the opinion that this hinge does NOT allow for the load-bearing portion of the push to extend further since controlling the steer of the blade at full extension through a single point on a hinge is impossible. Many skaters, at the introduction of the clap skate, tried to modify their technique to basically push off the toe at the end of the extension, but didn’t get anywhere, while the skaters who were the most successful through the transition to claps simply didn’t change their technique much, if at all, and allowed for the clap to simply facilitate a cleaner picking-up of the blade from the ice. The idea of being able to push off the toe has been around for a very long time, and early attempts at clap skates can be found in museum pieces dating back to the 60s, but I believe one of the main reasons that it took until the late 90s for the technology to be adopted was because it took a while for blade-engineers to figure out a way of making a blade clap with a mechanism that people would trust pushing their whole bodyweight through, and then some. The first thing I notice about short track skaters on the long track is that they have excellent corners, but look awkward and clueless in the straights. Long track skaters have the opposite problem on the short track. Short track skaters are also better at getting low. I seem to constantly be telling skaters that I coach on the long track that they need to get lower (so much so that it was one of the first phrases I learned in Danish, after “yes”, “no”, “thank you”, “I don’t speak Danish”, and “that’s what she said”). 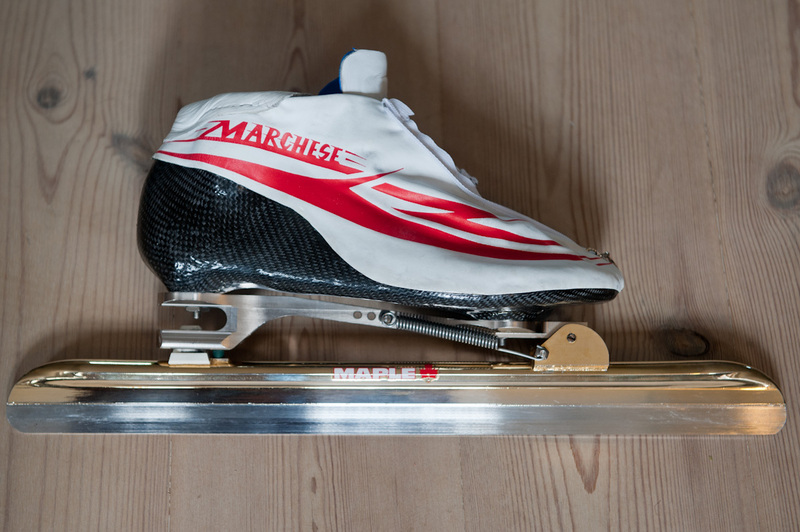 There are obvious technical benefits from skating lower on the long track, but the main benefit is with wind resistance. On the short track, however, if you don’t get low enough when you go into those tight corners at speed, you will fall. This has the effect of being a much more effective teacher than explaining fluid dynamics and the equations for air friction to a bunch of teenagers. Going into slightly more detail, short trackers tend to balance better than long trackers. With a fixed blade, and such tight corners, they have to stay balanced between the middle of their blade and the heel, and concentrate on kicking off the heel at the end of the push. Prior to the clap skate, long track skaters also had to do this (if you push off your toe with long speed skate blades, your toe will dig into the ice and slow you down, or make you fall), but with clap skates, a long track skater’s bodyweight tends to be balanced more on the middle of the skate, and is rocked forwards as the skater nears full extension. Due to the pack style of racing, a short track skater must be prepared to skate different lines through a corner. Sometimes the entry must be taken a little wider so that the skater can pass up the inside at the corner exit, at other times the entry must be taken very narrowly to prevent another skater from passing. In long track, consistency is key, and a long track skater pretty much only ever has to worry about skating one kind of racing line through the corner, never having to worry about passing or being passed. …doesn’t really apply to long track skaters. Every long track race is a maximal effort, and the ‘strategy’ is to go as fast as possible. I’ve written previously that skaters sometimes need to hold back in longer races, but this isn’t so that they have anything left in the tank at the end of the race, no – this is to maximise the speed over the entire distance – a long track skater should never have anything left in the tank at the end of a race. Short track racing on the other hand, is a completely different creature. While it isn’t unusual for a long track skater to only do 1 race a week, or maybe 2, a short track skater can expect to do up to 3 races PER DISTANCE which means 6-7 races is a normal minimum for a short track racing weekend. This necessarily demands a very different approach to physical exertion during a race, and also has radically different requirements with regard to training and preparation, both physically and mentally. Zooming in further, each individual short track race is its own little work of art. The time is rarely important in a short track race, so a skater has to figure out a way to get the highest possible position for the least amount of effort, so that as much energy as possible is saved for the final (or the relay). To do this, short track skaters need to not only know their own strengths and weaknesses, but also those of their opponents. If I were a short track coach, I would recommend a rudimentary understanding of game theory for anyone thinking of racing seriously. Bradbury’s gold medal is an example of this, he knew that out of the four skaters he was racing, one was defending Olympic champion, one was defending world champion, one was the world record holder, and one was a young Korean who would go on to become arguably the greatest short track skater ever to have lived, so sitting back and waiting for one or two of them to fall or get disqualified in an altercation was not a bad strategy, and he could have reasonably expected to get a medal. For all of these differences, the training must also be different. Physically, short track skaters endure more pressure in the tighter corners, and then get a little time off in the straights, they also have to train to be able to race several times a day with relatively short breaks in between each race. Because of the lower angles, short track skaters also have to be much more flexible than long track skaters. Long track skaters on the other hand, because they are able to go faster (simply because the track is bigger) have to train to develop a higher peak power output – that is, to be able to release a huge amount of energy in a short time. If you were able to plot power graphs for a weekend of short track racing the peaks would be lower, and there would be more of them, while for long track, there would be very few peaks, but they would be much higher. There are other considerations. Because of the area of ice involved, there are still currently NO long tracks anywhere in the world that have ice all year. There are many short tracks (a short track can easily be set up on any standard-sized ice hockey rink, you just need track markers and crash-mats) which have ice year-round, in fact Australia has one. This presents interesting challenges for writing good training programs. Short trackers have the luxury of being able to be on the ice pretty much whenever they want, and as a result, most of the training happens on the track. The Canadian team for example does very little biking and no inline (rollerblading) during the summer, and this allows their training to be very specific. Long trackers by contrast do most of their training off the ice either on a bike, or on inline skates, and of course lifting weights in the gym. Curiously enough, even if you were able to be on the ice all year in long track, because of the nature of the sport, you probably still wouldn’t be on the ice every day since that would make you good at developing very high levels of power for a long time, but not so great at developing those super-high peaks of power over a short time. The 10k – the longest distance, and hardly ever raced, takes less than 15 minutes, the 5k takes less than 8, the 1500m about 2, the 1000m just over 1, and the 500m just under 40 seconds, and at a high level competition it is extremely unusual to skate more than two individual distances a day. In short track, there are the 500, 1000, 1500, and relay but skaters often ‘specialise’ in more than one distance, and as explained above, have to skate each distance several times. Short track skaters also tend to be shorter, with very few being over 5’8 (172cm), while in long track skaters tend to be taller. Prior to the 90s, long track skaters used to always be quite tall, often over 6′ (183cm), but with all the indoor ice, the sport has evolved into a much more technical-finesse sport rather than a brute-strength sport, and a very wide range of body types are now represented in elite long track. A large portion of research and material for this article was contributed by Rémi Beaulieu, who has skated both short track and long track for Canada. Don’t forget to read my other Sochi special about the speed suits worn by long track skaters. Remember to click below on the sochi2014 tag to read other articles about these Olympics, including daily updates of the long track races. For the real nerds out there, there are older articles about the differences between ice and inline skating, on skating at altitude, the olympic selection process, my technique lab, and the major differences between the different long track blades. Interesting explanation of the differences, thanks!